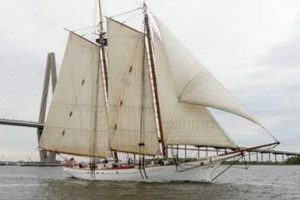 Members of the media are invited to come aboard The Spirit of South Carolina during a 3-hour open house on Thursday, Jan. 18, for interviews, photos, and video of the cadets and students as they receive instruction from the crew in preparation for their voyage. Media can come at any time from 9 – 10:30 a.m., while the ship is at the dock, and is welcome to stay for the harbor practice sail from approximately 10:30 – noon (weather permitting). Please email kkeelor@citadel.edu for more information, or to confirm attendance. The Citadel, located in Charleston, South Carolina, offers a classic military college education for young men and women profoundly focused on leadership excellence and academic distinction. The 2,300 members of the South Carolina Corps of Cadets are not required to serve in the military but about one-third of each class commission to become officers in every branch of U.S. military service. Graduates of The Citadel have served the nation, their states and their communities as principled leaders since the college was founded in 1842. The Citadel Graduate College offers 26 graduate degree programs with 42 concentration options, 23 graduate certificate programs, and eight evening undergraduate programs, through an all-evening schedule with many courses now available online. The Citadel was named Best Public College in the South by U.S. News & World Report for seven consecutive years, and No. 1 Best Public College for Veterans in the South as well as Best Value out of all South Carolina colleges and universities by Forbes.